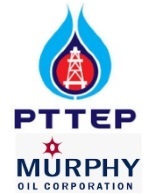 édité le 21/03/2019 - Plus de news de "PTTEP" - Voir la fiche entreprise de "PTTEP"
PTT Exploration and Production Public Company Limited (PTTEP), makes a success acquisition in Murphy Oil Corporation’s business in Malaysia worth USD 2,127 million which is expected to promptly add sales volumes by 15% and operating cash flow right after the deal is completed. Furthermore, the company also announces the success in winning two exploration blocks off Malaysia coast. These demonstrates PTTEP’s significant business progress in Malaysia. Phongsthorn Thavisin, PTTEP President and Chief Executive Officer, said PTTEP HK Offshore Limited (PTTEP HKO), a wholly-owned subsidiary of PTTEP, has signed a Share Sale and Purchase Agreement (SSPA) to acquire the 100% of Murphy Oil Corporation’s business in Malaysia through the equity in two subsidiaries - Murphy Sarawak Oil Company Limited and Murphy Sabah Oil Company Limited. The acquisition includes five petroleum exploration and production projects – the Sabah K project, the SK309 & SK311 project, the Sabah H project, the SK314A project and the SK405B project. The acquisition will be funded by PTTEP’s available cash on hand and is expected to complete by the end of second quarter of 2019. “The acquisition is highly significant to PTTEP’s growth in both the short and long term, strengthening our business in alignment with the strategic plan. We expect that it will boost up net sales volume around 48,000 barrels of oil equivalent per day (BOED) immediately.” said Phongsthorn. Those five oil and gas projects are located in shallow and deep water off Sarawak and Sabah. Projects in the producing phase include the Sabah K project and the SK309 & SK311 project, in which PTTEP will become the operator. Both is considered one of the major projects with the gross production volume of approximately 100,000 BOED. The Sabah H project is in the development phase with a plan to commence the first gas production in the second half of 2020, supplying 270 million cubic feet per day (MMSCFD) to PETRONAS’ Floating Liquefied Natural Gas 2 project. Combining these three projects, gross production volumes under PTTEP’s operation will become 140,000 BOED in the next four years. Meanwhile, the SK314A project and the SK405B project are under the exploration campaigns. "PTTEP will fully cooperate with Murphy Oil Corporation to ensure the smooth transition of operatorship and maintain the best practice of these strategic business. About 600 Murphy staff are warmly welcomed to join us and we will carry on our duties in promoting national energy security and delivering long term benefits to Malaysia” he said. In addition to the acquisition of Murphy Oil Corporation’s assets, PTTEP HKO together with PETRONAS Carigali Sdn. Bhd. also signed Production Sharing Contracts with Petroliam Nasional Berhad (PETRONAS) for exploration and production rights of two offshore blocks, PM407 and PM415, in shallow waters off Peninsular Malaysia under Malaysia 2018 Bidding Round. The awarding reflects the company’s strategy in capturing investment opportunity in potential areas particularly Southeast Asia. Considering this acquisition and the success bid of two exploration blocks together with PTTEP’s existing operated blocks, Malaysia will become one of the major investment countries of PTTEP in addition to Thailand and Myanmar. Meanwhile, PTTEP will become the third rank in Malaysia in terms of reserves and resources it holds in the prolific areas of offshore Peninsular, Sarawak and Sabah. “PTTEP is enthusiastic to expand our investment in Malaysia. The recent investments further strengthens our portfolio in high petroleum potential area of Malaysia as we move ahead with our “Coming Home” strategy in expanding investment in Southeast Asia. We are also pleased to extend the collaboration with our long-standing partner PETRONAS and look forward to applying our expertise and experience in this region to create benefits for both countries.” said Phongsthorn. Currently, PTTEP’s portfolio in Malaysia comprises the Sarawak SK410B which is assessing the fields’ resource potential and under drilling preparation of an exploration well, the Sarawak SK417 which is evaluating the petroleum potential and the Sarawak SK438 which is now under drilling preparation of two exploration wells. PTTEP also has producing project in Blocks B-17 and B-17-01 in Malaysia–Thailand Joint Development Area (MTJDA), and jointly invests with PTT in MLNG Train 9 Project, a LNG liquefaction plant, through PTT Global LNG Company. Murphy Oil Corporation (NYSE: MUR) is a global independent oil and natural gas exploration and production company. The company’s diverse resource base includes offshore production in Southeast Asia, Canada and Gulf of Mexico, as well as North America onshore plays in the Eagle Ford Shale, Kaybob Duvernay and Montney.